Well, we weren’t the big lottery winners on Saturday night, but we did decide that IF we won, I would keep blogging (goes to show that I genuinely love it!) but we would definitely be taking vacations and traveling more. I think we only went out of town once last year for Spring Break. Did you play? I can’t believe no one won! I posted a picture on my Instagram over the weekend of a small spot in our kitchen, and a Jennifer and Cindy commented that they’d like to see a kitchen styling post. I’m all for that since I’m always arranging and rearranging things. 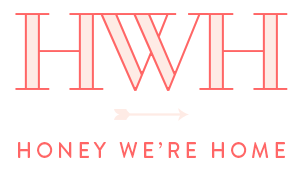 In fact, I figured I’d make it a whole series and show how I style things around our home in general. First up will be the kitchen, and let me know which room you’d like to see next or if you have specific questions. 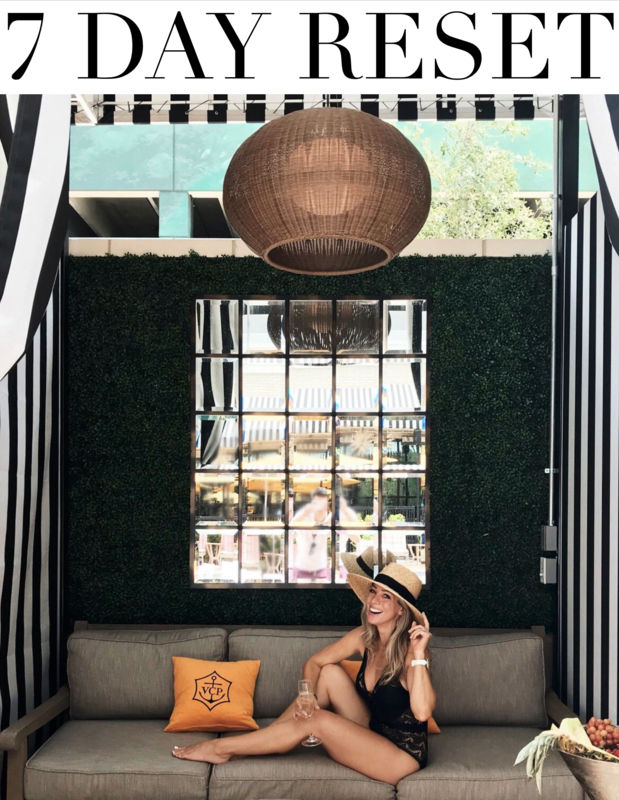 Over the years, I’ve learned that adding accessories and personal touches are the elements that make a room look complete and lived in, even though I enjoy erring on the minimalist side when it comes to accessories. Less is usually more for me. 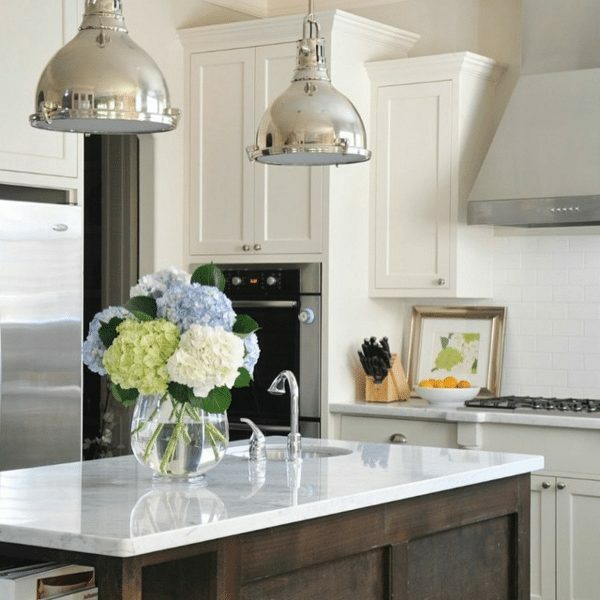 Styling, especially in the kitchen, is a balance between beauty and function, right? How much of your “stuff” do you want to see everyday? What do you really need to keep out (even if it’s not the prettiest) because it’s much more convenient than having it stashed away? 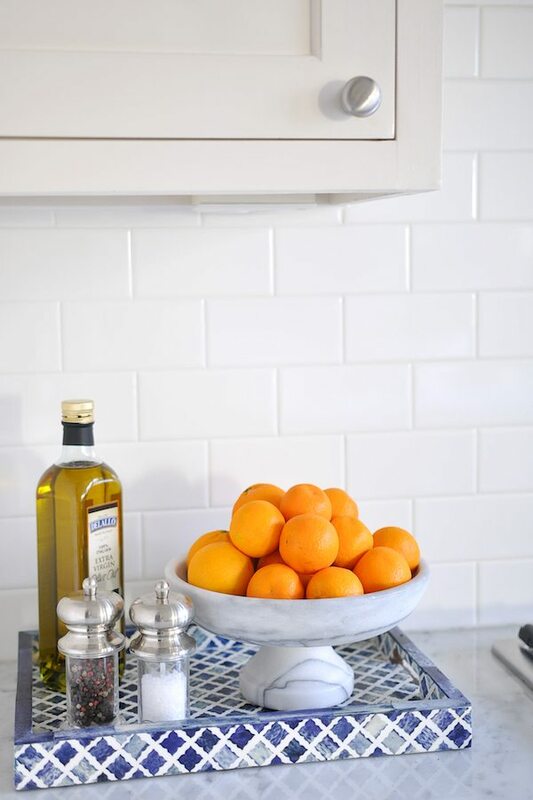 Especially in January when I’m craving a fresh start, I tend to lean toward having more things put away than out on the counters because it just feels more airy and clean. But, our kitchen is large with lots of storage space, so it might be easier to do that here. 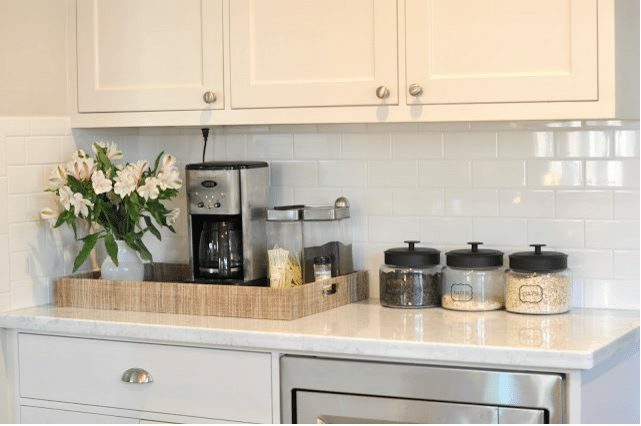 Even if you don’t have as much storage or a smaller kitchen, just keeping out the necessities can be made to look nice if you use pretty vessels and trays. Remember that bowls and containers can have multiple uses also. I think this marble bowl is meant as a fruit bowl, but in the past, I’ve used it in our “drop zone” to hold keys, sunglasses, spare change, etc. The bone inlay tray has been in different rooms in our home as well, specifically, the bathroom where it held beauty items. 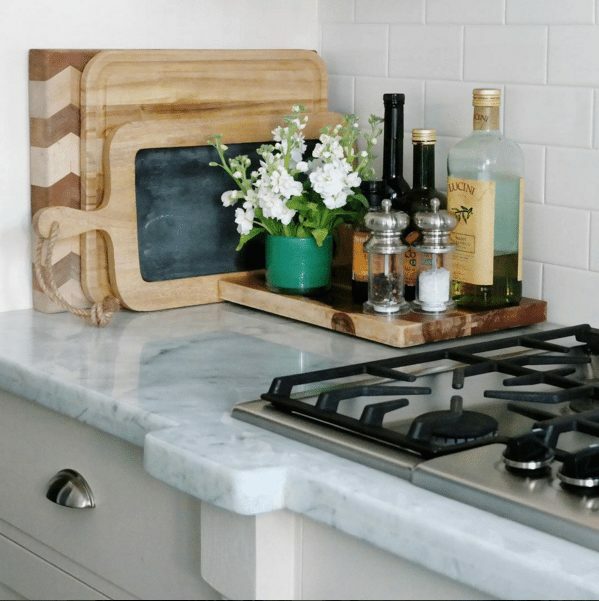 If you don’t have a pretty tray, wooden cutting boards also make good ‘trays’ and go well in the kitchen. I always alternate between keeping our cutting boards out or putting them inside the bottom drawer in our kitchen island. For now, they’re put away and the other seasonings I use most often are up in cabinet above. 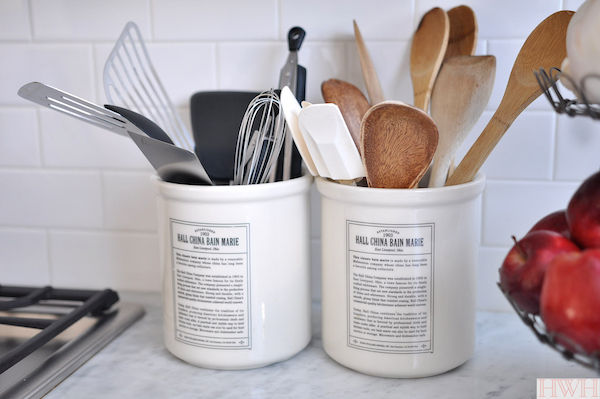 Your kitchen utensils like wooden spoons and spatulas can look gorgeous when stored together in a nice container. We keep the ones we use most often in our Williams Sonoma jars (with the wooden and white in one, and the black and metal in the other). Similarly, because we eat almost exclusively at home, we tend to keep food out on our counters. 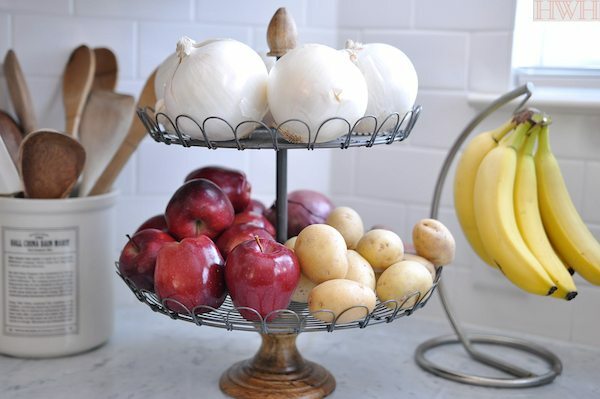 The main things are onions, garlic and potations, and also some fruit, tomatoes or avocados. At your kitchen skin, keep out only the necessities for a more streamlined look. We have the liquid dish soap and hand soap within arm’s reach, along with maybe a plant and/or vase of fresh flowers for the pretty factor. I’ve decanted our liquid dish soap into olive oil jars in the past, but function won because these Method pump dispensers are my favorite, and with as much dish washing that goes on around here, I’m fine with using this plastic bottle. 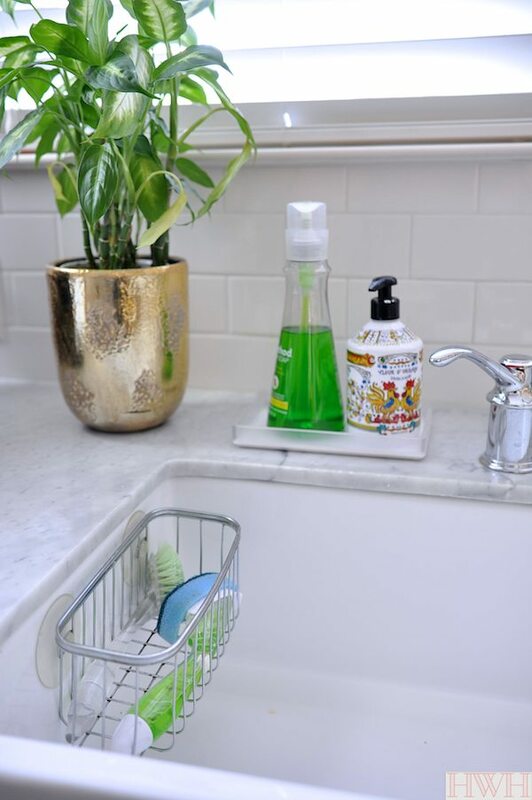 Our hand soap is in a colorful container from World Market, and even though the soap ran out a long time ago, I just keep refilling it with inexpensive hand wash. Keeping both the dish soap and hand soap on a small tray helps keep it tidy. Another thing I’ve conceded we need to keep out are our dish washing sponges. Although they’d be prettier kept under the kitchen sink, I’d much rather have them out so I don’t have to keep bending down to reach them – especially at 32 weeks pregnant now! This wire basket is pretty discreet. I do actually think about the color combos I’m using though- notice the green soap and blue and green brushes. Totally intentional because I like those colors in the kitchen. 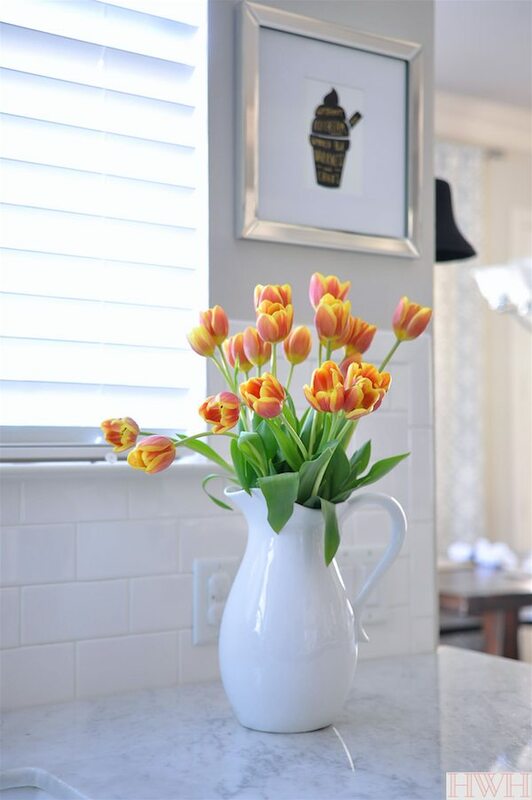 Tulips are a flower that look so gorgeous in a kitchen and really liven it up. Actually, any flowers can do the trick. Here, I put two grocery store bunches inside a non-traditional vase, a white ceramic pitcher. And don’t forget about your walls! 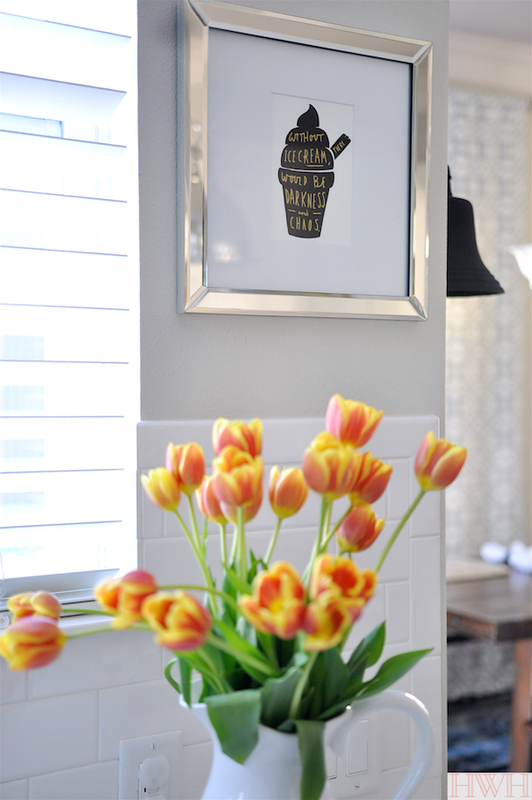 If you have space, a print can add character to your kitchen. Given my family’s love of ice cream, this print is particularly appropriate. 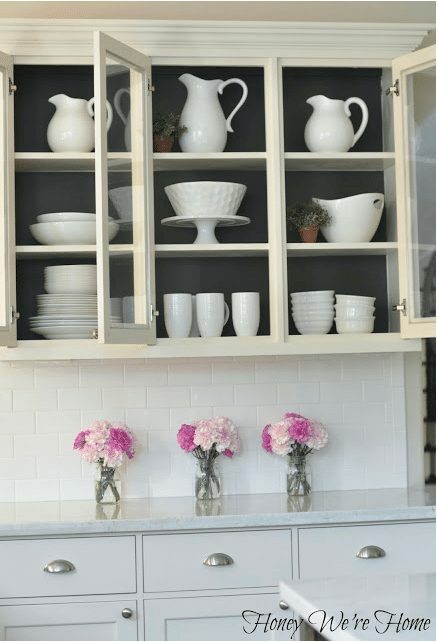 Open shelving or glass cabinets are another opportunity for styling. In our glass cabinet, I painted the back dark grey and then styled it with our white ceramic dishes. They really pop against that dark background. Mason jars make good flower vases too and carnations are inexpensive and last forever. I try to keep nothing on our kitchen island except maybe a vase of fresh flowers. In the picture below, I framed a page from an old calendar- worked nicely as a piece of art! 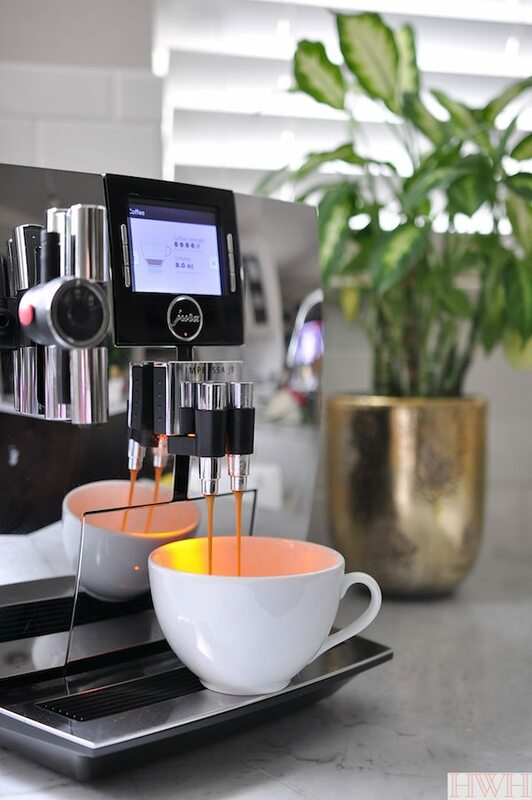 Let’s face it, most small appliances just aren’t that beautiful to look at. You could put them away in a cabinet or pantry, but means more effort in pulling that thing out when you need it. Especially in the morning, ain’t nobody got time for that! Things we choose to keep out on the counter are small appliances we used daily: 1) coffee maker, 2) Vitamix blender, and 3) toaster. 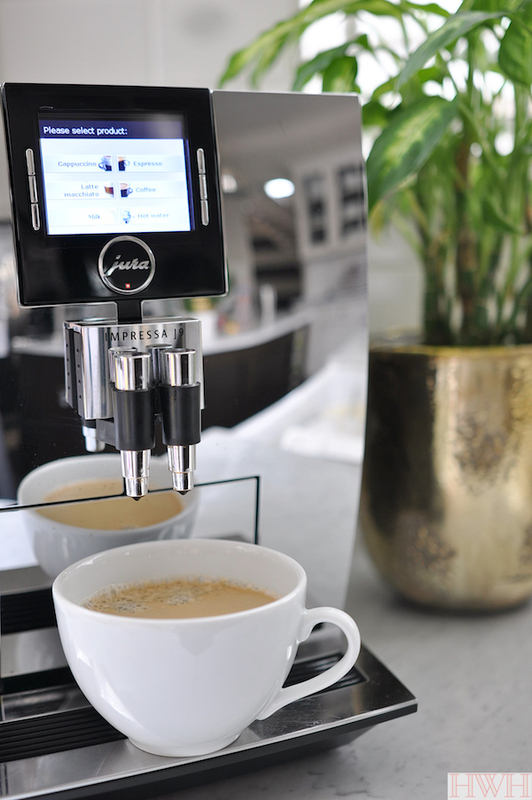 The coffee maker is a no brainer. Both my husband and I use it every morning and it’s too big to fit anywhere else. Also, it’s one of those fancy coffee makers that was a Christmas gift from my husband to us a couple years ago, so it’s been an investment. 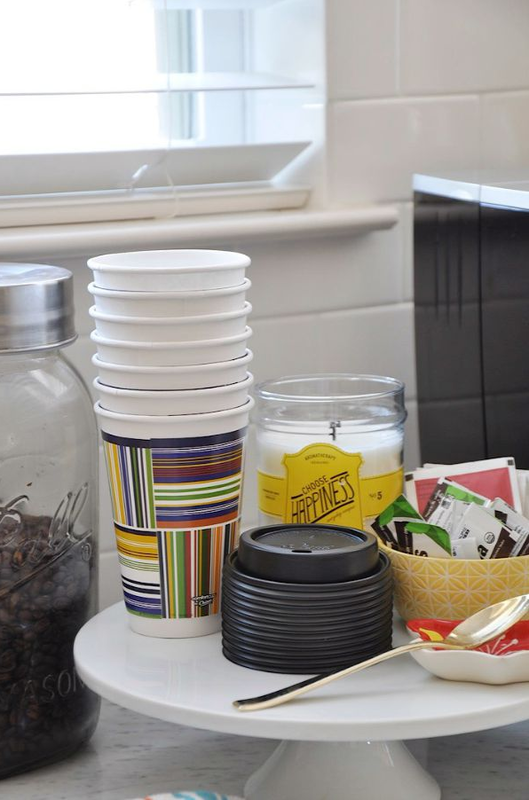 We keep our fresh whole beans decanted in a big Ball jar right by the coffee maker and the to-go cups we often use in the morning. Those are placed on a white cake stand, along with sweetener, tea, and a fox tea bag holder. Cake stands can act like trays to keep your things nicely corralled. 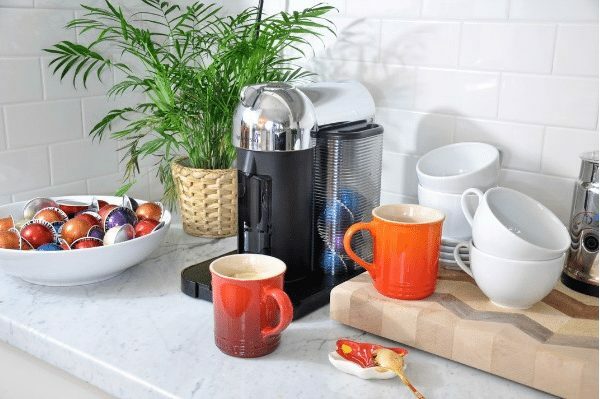 When we used the Nespresso more, we had it out and the colorful pods decanted into a white bowl with the coffee mugs and saucers sitting out on a cutting board. 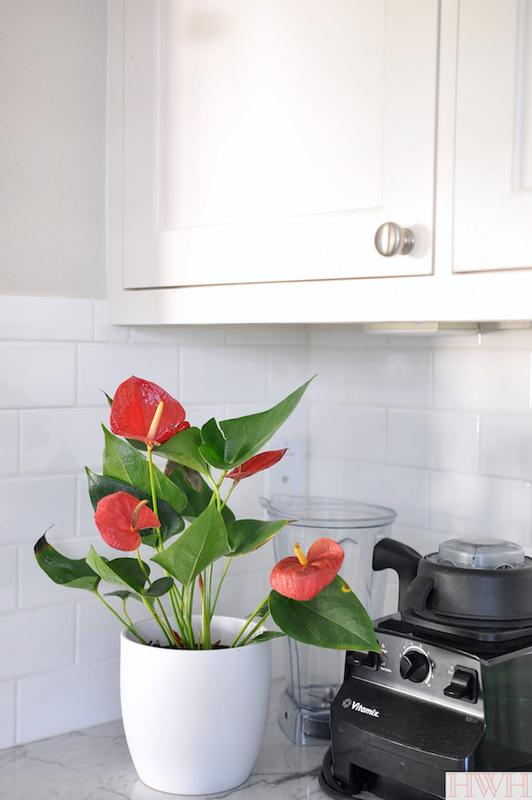 Live plants and flowers always add life and charm to any space you’re styling. And be mindful of what you put your plant or flowers in – those are great opportunities to add color or like, here, texture with a woven basket. 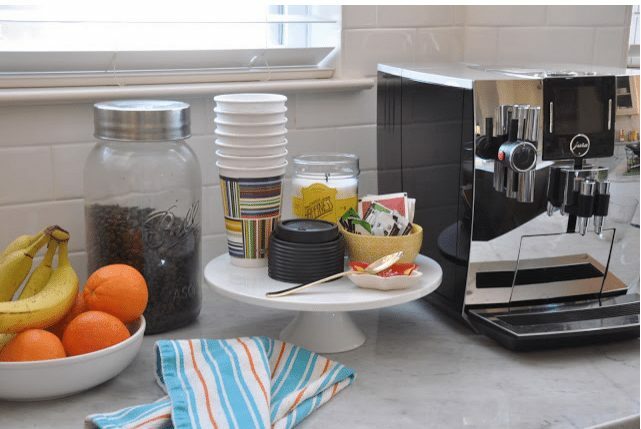 In the past, we had our old coffee maker in this spot, with coffee grounds and sweetener in glass containers. I also kept my oatmeal decanted in glass containers. Decanting is much more beautiful than seeing the store’s boxes of stuff. Keeping your containers all in similar colors, sizes, or shapes will add cohesiveness to your styling, but it’s all a matter of preference or taste. If you prefer bright red canisters, go for it! The Vitamix? I’d love to keep that big thing under the cabinet, but my husband makes smoothies everyday and it’s just easier to keep out. It’s problematic though, because it’s too tall to fit under out cabinets without taking the lid off. Bummer. 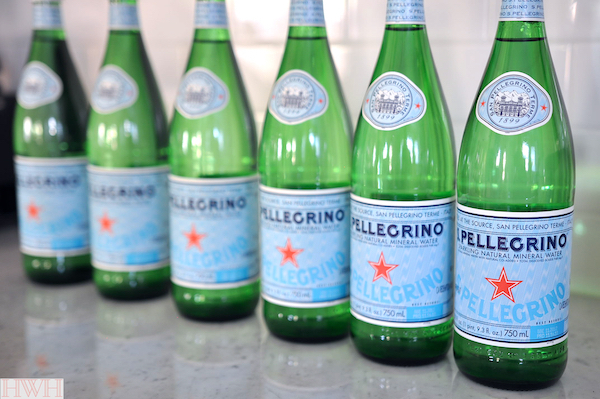 I like the pop of green the Pellegrino bottles add, even though we don’t drink them! And I couldn’t resist updating our butter dish when I saw this cute floral one at Anthropologie. Do you keep your butter in a dish too or in the fridge? 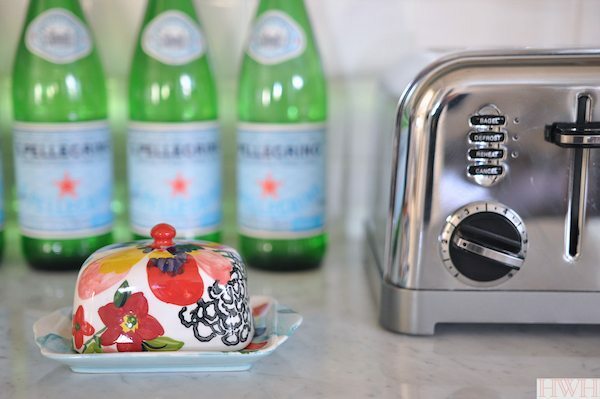 I didn’t realize that even your butter dish could be so cute. We had a plain white one before. I know we’re not fooling anyone that there’s a blender here, but the pretty Anthurium plant that was given to us at Christmas helps camouflage it some. Our kitchen is a real life kitchen, just like yours. We cook (a lot) and there are always dishes, pots and pans and counters to clean. Not to mention, the constant pile up of paperwork, mail, and other general clutter that comes with day-today life. It’s difficult to appreciate pretty styling in a dirty kitchen, so I made sure to photograph when things were looking good! We still do the evening 10-minute pick-up and that helps keep things in order. 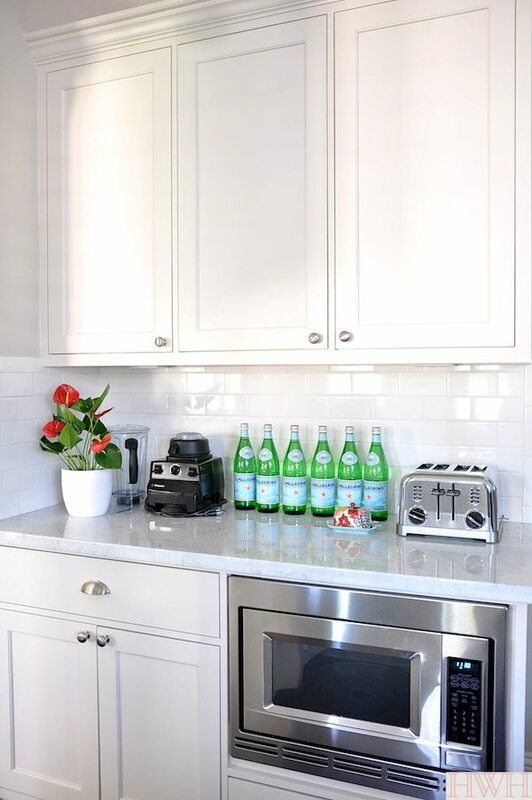 If you’re ready to style your kitchen, start with getting it clean, then think about what things you can put away so that you can style the rest in a way that looks good to you. Use trays, containers, bowls, vessels, and cake stands as unique storage. Bring in fresh flowers or plants to breathe new life into your space. Have fun arranging and rearranging until you find what works best for you! I tried to link everything in the post in case you’re interested, but let me know if I missed something you want to know more about. 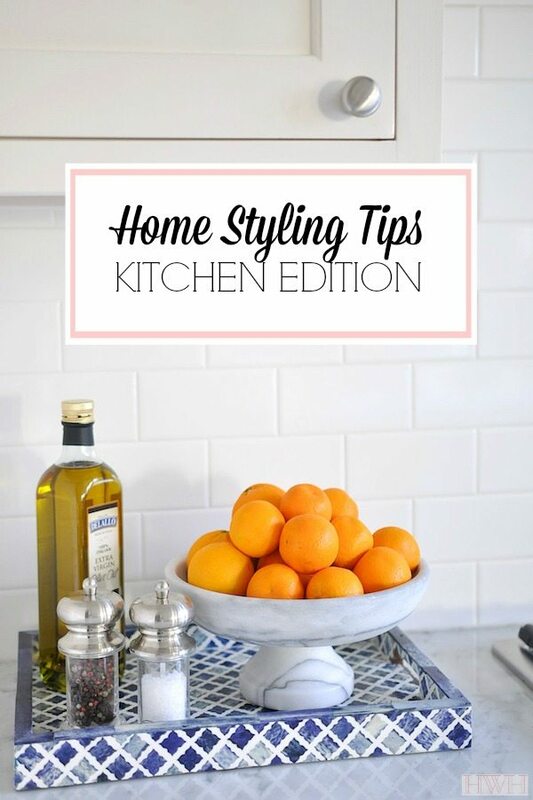 Is your kitchen ‘styled?’ Which Home Styling area would you like to see next?! I'm having small appliance dilemma right now. I can't seem to find the perfect kettle or toaster. It's driving me mad! I've seen so many cute kettles but we don't have one. I know they all function differently, but when you find the one you love, it will be a great addition! Love this post!!! Wish our counters were marble, instead of corian. Hello 1993! I'm making a list from your post: cake stand, marble bowl and a wooden one. I need to elevate! Thanks for reminding me I need to do a post on that! We have our fair share of scratches and stains, but they don't bother me much. We do have big chips around the sink from banging with pots and pans, I assume. I'm going to put this topic on my "to do" list so I can go in depth more and show pictures. Yay! Thank you so much! =) Happy Monday!! I was secretly hoping you would blog about this after I saw your Instagram post!! 🙂 I have basically the same kitchen layout, however struggle to accessorize with black granite counters and dark wood cabinets. Suggestions appreciated! I would also love to see how to style in the bathrooms-powders room, kids bath, master bath, guest bath ideas all welcome! 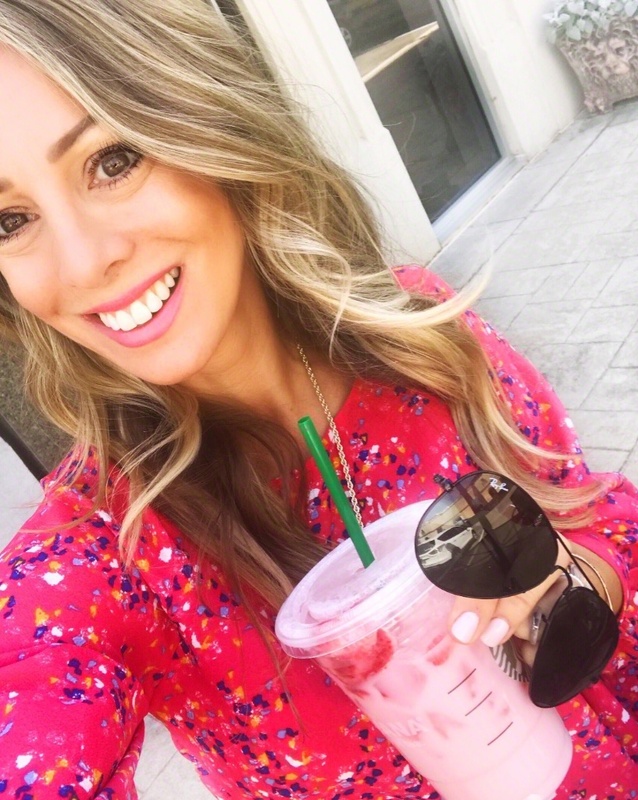 Love your blog!!! That's exactly what we had in our townhouse- and not much counter space at all. I think I used stainless steel containers or white. I'm gonna look for some pics and see if I can send you for some inspiration. Thanks for letting me know what you'd like to see, I'm gonna work on that. I hope to have a new post up every other week. Your kitchen is beautiful! I love to hear your styling tips 🙂 Thanks for sharing! That sounds so pretty! I've never used a French press, but I love the look and simplicity of them. I'll keep the centerpiece in mind, you're right- I'm always moving mine on and off the table and it's kindof a pain. Need a small, low bouquet of flowers or maybe a bowl of fresh fruit. I've seen people put a bunch of crayons in a dough bowl as a centerpiece, works well especially if it's young kids using the table. Our kitchen is pretty small. I would prefer to keep the counters clear, but we use all of the things we have out every day. Unfortunately, that means we have maybe 2 feet(separated by the stove) of actual usable counter space. Your kitchen is pretty much my dream kitchen! That's how our townhouse was! No island and hardly any prep space! Love how you corral everything in trays and stands and things! It really makes everything look neater. We have a small kitchen with very little counter space so I'm simplifying and try to keep everything in cupboards instead of out on display. Thanks Amanda. Always moving things around. I prefer most things out of sight too. Thank you so much for all the links you used in your post, very helpful! In our home kitchen we also keep most appliances in cabinets and only keep what we use everyday on the counter but I must admit our toaster doesn't look nearly as clean as yours. We have the same Cuisinart toaster and for some reason, the stainless steel continues to tarnish often no matter what cleaning product I use. Would you mind sharing what stainless cleaner you use for your toaster? I'm jealous of how much cleaner yours looks and would love to get ours back to the same sparkle instead of simply buying a new one 🙂 Thanks a bunch! I just use a microfiber cloth and some windex or whatever I have on hand. I'm not sure why it's held up so well, we've had it for years. I hope you can get yours looking good again- bummer to have to buy a new one. Love! So clean and bright. Yes, stands, trays and such are a must. We too USE our kitchen. Everyday things we use are out, and within easy reach. We basically divided our kitchen into zones. Makes working in it so much more efficient. We did the same with our pantries. 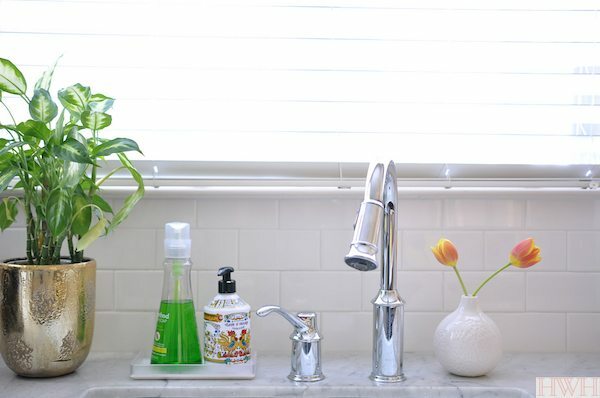 Would love to see a post on how you style your bathroom counters. We have separate counters and not a ton of space. And, I hate having everything out, but somethings it is a necessity. I know the struggle about the bathroom counters. "My side" is pretty sparse and most things are kept in drawers, but my husband keeps most of his things out on a tray- I let it be, but that would drive me crazy! Homegoods is a great source for things you can use in your kitchen. It's hit or miss, you just have to stop by often to see what's new and grab before anyone else! I've been working on restyling my office too. I really prefer a clean, clear desk space, but keep some things out for function. I've been trying to whittle away the paperwork too- I realize I really don't need much of the paper that's hanging around. 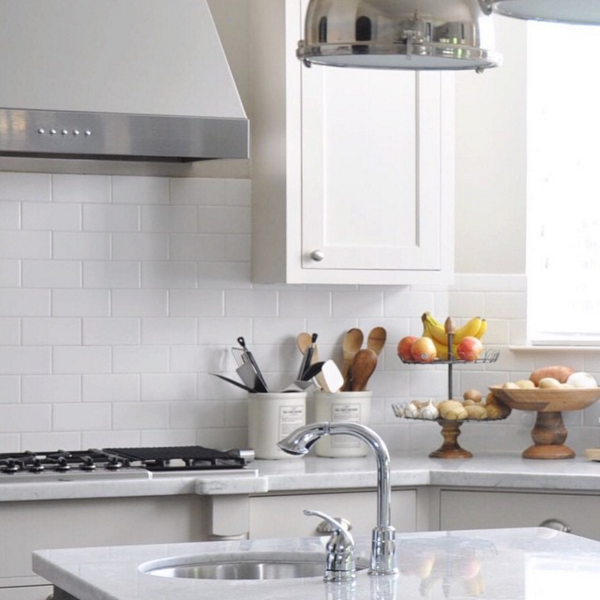 Your kitchen is so swoon-worthy, and these pics so gorgeous! Oh, and that marble bowl will be MINE…thanks for the link! Your kitchen is so beautiful, friend! And I love your practical approach to the things you use on a daily basis! The reusable ones are more Eco-friendly, these are just so dang convenient. Maybe if I had a travel one I loved, I'd make the switch, but you're right, gotta have it available and clean to make it work! My blender doesn't fit under my cabinets either, except when I turn the jug upside down, it fits on the base that way. Worth a try?! Ours guys sound the same;) yes, I'll try that! It never occurred to me, thanks! Ours doesn't fit if I put the pitcher on and try to slide it under, but if I place the base first then bring the pitcher up under the lip of the cabinets, if that makes sense, it does. Just have to take the pitcher off first to slide out for use. It really isn't that big of a deal. We do have the smaller ones as well, so I could keep one of those on it to save time making smoothies. 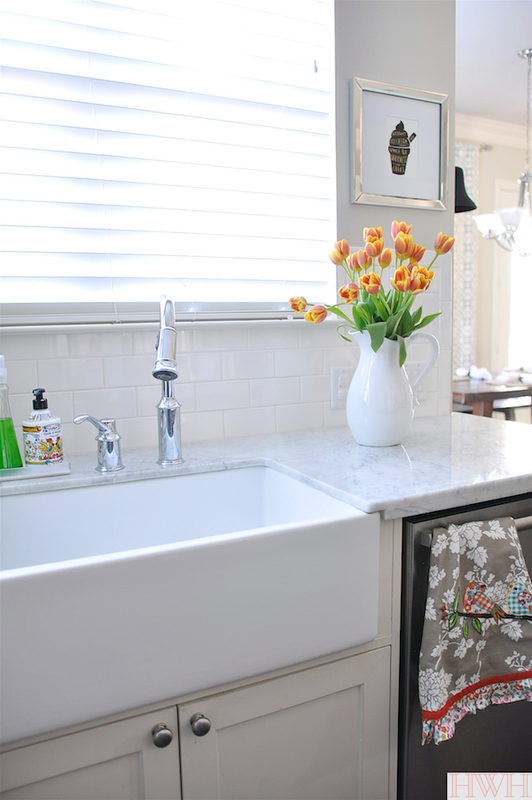 Do you know what type of edging your countertops are? Mitered edge, eased edge? Your kitchen is absolutely beautiful! One thing I didn't see a link for is the really small tray you use under your dish and hand soap by the sink. I guess a normal person would just look/shop for one, but I always say I shop like a man – no browsing, just get in, get what I need, and get out! I'm like that too, usually. Just for time's sake! I looked for that little tray but couldn't find it, I think I got it at The Container Store. It's great in that spot because I can wash it easily and the perfect size. Great post, thanks! I'm in the midst of building a new home and am working on the kitchen layout. I noticed you have a microwave under the counter. It doesn't look like the drawer type microwave–do you like it? Or do you get annoyed bending over to push the buttons, etc? I'm trying to decide if I want to put mine like yours or stack it on top of double ovens (which seems like a lot of stainless steel). Thanks! Our microwave has a swing door, not a drawer. I'm short (5'0) so it doesn't bother me, it's more difficult for my husband, but I've never heard him complain. We put ours down low because otherwise it was going to go at cabinet height, which is way too tall for me. My sis-n-law has hers above her double oven and likes it. Best wishes to you on your new home- that's exciting!! Lovely Kitchen! 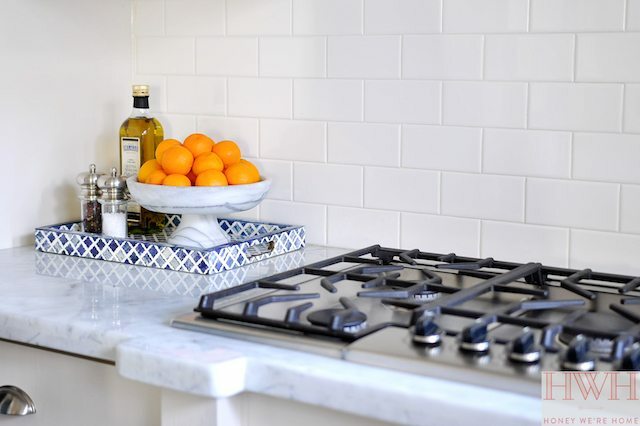 Where did you get your backsplash? 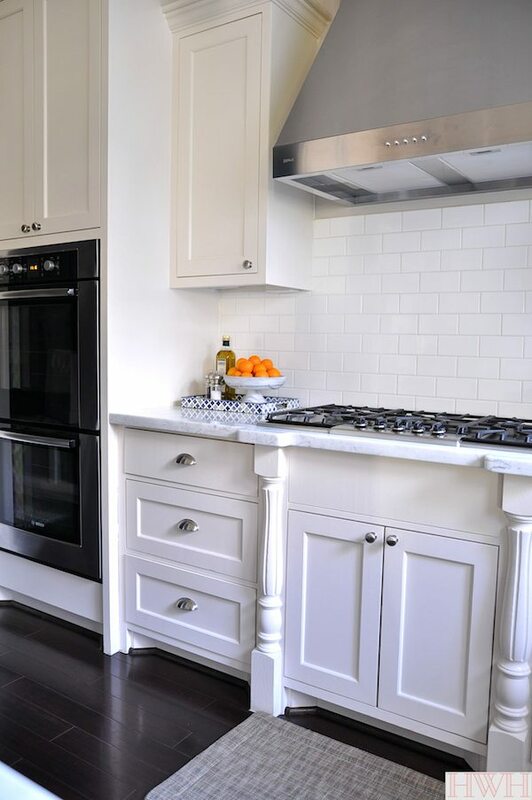 I love that white subway tiles. I'd appreciate it if you can help me. Thanks! Where are your pendent lights from? Been looking for a size like those!